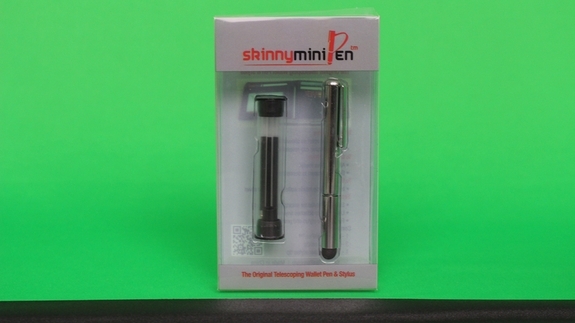 This unique Skinny Mini Wallet Pen/Stylus is so tiny, you could almost forget it's even in your wallet. However, it's also so practical that you'll find yourself using it almost daily. It fits perfectly into the center fold of any wallet, giving you an effective writing instrument and smartphone stylus in one convenient, compact package. Even though it's tiny when stored, you can use the telescoping feature to extend it to your desired length. The stylus tip easily glides along the surface of any tablet or smartphone. Or, just unscrew the stylus cap to reveal an ink wallet pen for quick signatures or note taking. It's quick, easy and, best of all, totally modern. When you go to order the Skinny Mini Wallet Pen, you'll have a few different colors to choose from. These pens are so affordable that you can grab a mini for every wallet you own and indulge in a little color matching. Who says a pen can't be stylish too? 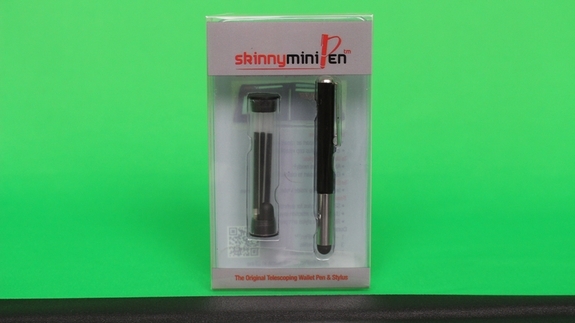 In our Skinny Mini Wallet Pen kit you'll get the extendable mini pen and a canister containing two extra ink cartridges for refilling the pen. We know you'll be using this pen a lot throughout the day, so that's why we've included the extra ink in the main kit. Whenever you find yourself running low, grab one of our Replenishment Kits for the Skinny Mini Pen. The Replenishment Kit comes with five, yes FIVE, ink refills in medium point black ink. This kit also comes with a replacement stylus nub in black. With the combination of a mini pen and stylus, this convenient tool will quickly become one of your essentials to keep on hand at all times. 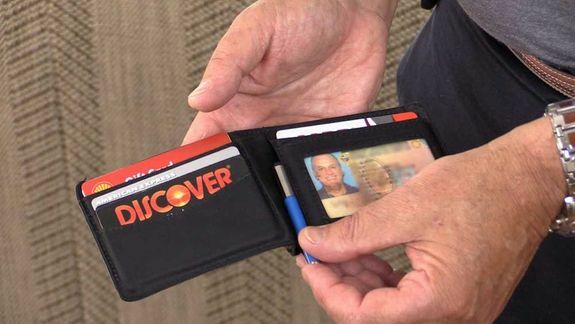 Use it with any of our Mini Skinny, Super Skinny or Skinny Flat wallets for convenient access. 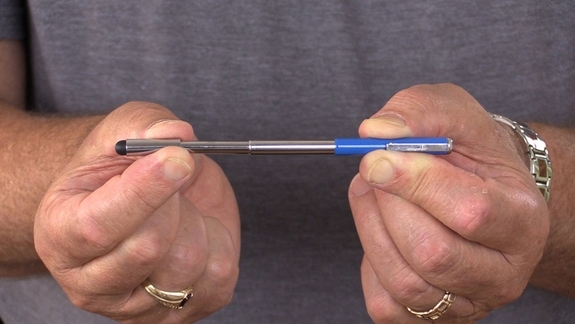 Just pop this little tool out any time you need a pen or stylus on the go. Now I always have a pen with me, in a place I can find it (i.e., the fold of my wallet). Tiny, lightweight, works great. I read the reviews but decided to try it anyway. My mistake. Stopped working after a week. Ink cartridges do not work. I've had one mysteriously dry up (ink was just gone) , one leaked and one just didn't work. You will have to improvise with using other pens ink cartridges that fit properly. The construction of the pen won't last long. It will fall apart quickly. I've made some super glue repairs to keep it functioning. Feels like I'll be doing that again real soon. Overall it should be a $2-$3 item you'd find at a novelty store or flea market. Good idea but certainly not worth it. This little pen is great, when it works. It will only produce ink for a short period of time, then quits working. If you let it rest a bit, then it will start working again. It's really annoying, but I love the size of it. Not sure what to do. Works great and fits wallet perfectly! Just what I needed, a small pen for the wallet that extends for writing. Happy with this purchase! I rate this product 4 stars becuase I really appreciate the design and the small, family run type of business. The time it lasted was a big let down though. It was a Christmas gift to my husband, he was really thrilled to receive it because he had been looking for a wallet pen for a long long time. One week later he found out the pen was not writing anymore. So we tried to change the cartridge..the pen still doesn't work.. I felt really sorry, as I knew that there's no pruduct like this around..and I was planning to purchase one for my father in law too.. 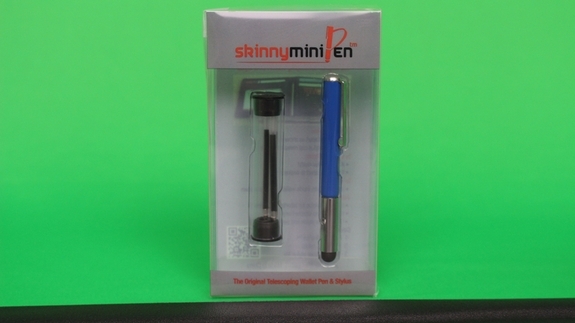 The skinny mini pen arrived with the rest of my order. Unfortunately, none of the included ink cartridges would write. Customer Service responded quickly and indicated that a replacement would be sent to me. That was a couple of weeks ago, but it hasn't arrived yet. Because of the terrific custom service, I gave this a "yes" for my recommendation for a friend. I've had my Skinny Mini for a number of years now and have nothing negative to say. I'm surprised to hear that people have had the cap innards fall out and get lost. It may have been redesigned because when I look inside the cap, I don't see any part that could separate. Mine has traveled to far corners of the world and has held up to the challenges of travel fine. I was surprised to read some people thought it was delicate. I'm not particularly careful with stuff, and to me it is pretty tough. Having a pen available in a space that is otherwise unused is great! I was so happy with my Big Skinny Acrobat with my Skinny Mini Pen that I bought them as gifts for both my brother-in-laws and my dad got the World Bi-fold. The Acrobat has a built in money clip, so the pen really works well with that set up. It doesn't get hooked up in a cash compartment like one reviewer said he didn't like. For review ideas I would second the idea that the fine threading on the pen cap seems overkill and takes some dexterity that really isn't necessary. A cap-less version would be nice. I used to keep a telescoping pencil in my wallet that twisted at the end to advance the lead, for example. The final thing on my personal wish list would be refills in blue ink. Overall great product sure to be liked by anyone you know who deserves an unusual gift! ProsSmall, telescoping, tough, ink, and it's there when you need it. ConsNone, really. It's terrific as it is. I am always looking for something to write with so I got this for the Zippered wallet.